In the past, patients could only choose between a partial denture or a dental bridge to restore the function and aesthetic of a missing tooth, but the last 30 years of dental treatments have shown that dental implants are an easier to install alternative that offers a better quality of life in a more affordable solution. A dental implant is a direct replacement for the root of a tooth and is used to hold an artificial tooth or bridge that looks and feels like a real tooth. 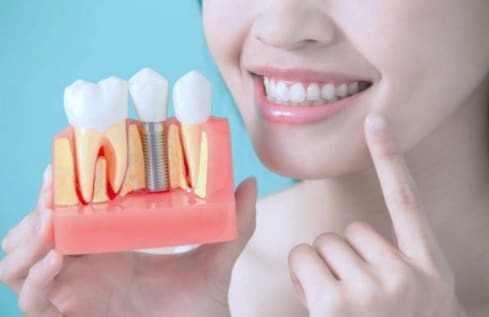 Dental implants are a good option for candidates that don’t want a bridge or partial denture, but have suffered from tooth loss from: periodontal disease, failed root canal, or have had their tooth knocked out. If you’re looking for an experienced implant dentistry then give us a call today at Carson & Carson, DDS in Oxnard and Camarillo (805) 983-0717. The significant advantage of getting a dental implant is that it provides a more comfortable feeling of chewing food as it is the functionally closest thing to a real tooth. The success rate of dental implant treatments is very high and it is becoming a popular procedure for many patients needing replacement teeth as it is not too expensive. Learn more about the average cost of a dental implant. Compared to dentures, an implant allows you to keep your teeth in your mouth, rather than in a cup. As well as feeling more natural, dental implants allow you to speak easily and normally. Unlike dentures, a dental implant never has to be removed when eating or fixed when speaking. Implants cause less damage to other teeth when compared to dentures because they are not sliding around in your mouth or brushing against your teeth or gums constantly. When a tooth is removed from your mouth, the jaw bone can deteriorate because it is no longer actively supporting the bone of a tooth. By fusing with your jawbone, dental implants are the only restorative treatment that preserves and stimulate the natural bone of your jaw. Implants are so similar to the look and functionality of a natural tooth, that even your jaw believes it’s a real tooth. More predictable than other restoration treatments, dental implants with crowns are less vulnerable to cavities or tooth decay. Although they do have to be cleaned just like any other tooth, implants are practically invulnerable to the damage that plaque and tartar can cause to normal teeth, meaning they can literally last a century when taken care of properly. If you want an implant that will last you a lifetime, visit the offices of a 45 years experienced Oxnard Dentist – Carson & Carson, DDS (805) 983-0717. Dental implants are divided into two main categories: Endosteal Implants & Subperiosteal Implants. The main difference being whether or not the implant is placed into the jawbone or not. Endosteal Implants: This type of dental implant is placed directly into the jawbone typically through oral surgery. After the implant is placed, the tissue surrounding the site is given time to heal, and a second surgery is needed months later to complete the placement of the post into the implant itself which then can have a crown or bridge placed over it. 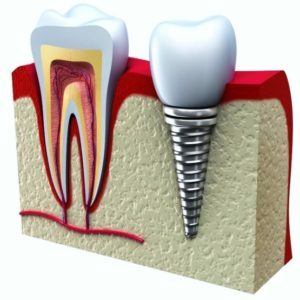 Endosteal are commonly used dental implants that are often made of titanium material. Subperiosteal Implants: This type of implant is placed above or onto the jawbone without entering the bone itself. After it is placed, the patient is given time to let the surrounding tissue heal and allow the implant to settle onto the jawbone. Different from Endosteal implants, Subperiosteal implants have posts that protrude through the top of the gum which allow a crown or bridge to be placed over them. At Carson & Carson, we offer our patients the option of setting up an appointment for a same day dental implant. The main drawbacks to getting a same day implant is that they are higher risk & higher cost. Getting an implant is a serious dental procedure that often takes months of healing before the end result can be achieved with the placement of a crown or bridge over the implant itself. Having an implant & crown installed in a single day increases the risk that you will lose implant & crown as a whole. If a same day implant is something you are in need of, you can get brand new looking teeth in just one trip to our office with no temporaries, no second injection, and no need for a second visit for awhile. Call today for a consultation for same day dental implants (805) 983-0717. This patient had a pre-existing long span bridge where the last molar failed and the bridge had to be cut. Only the front two abutment crowns were left. Three dental implants were placed, replacing his bicuspid and two molars. After four months of implant osseointegration, the case is crowned. See the next photos below for the crowns. This is the case after it has been restored. The three implants are now integrated after four months. Then they are now crowned. The crowns on the implants look better than the real teeth with crowns. View more of our dental implant case studies. Carson & Carson, DDS was the first Oxnard dental practice to provide our patients with our own dental CT scan. This allowed us to offer great dental care at lower costs with less extra travel time and waiting for results. Our state of the art dental CT scans allows for more accurate planning and safe placement of dental implants without causing any unnecessary trauma or complications during the procedure. 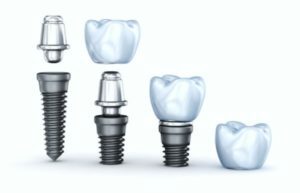 During the implant procedure, a titanium screw is surgically mounted to the bone of your previous tooth root. A porcelain crown is then attached to the titanium dental implant and the end result is a natural looking, artificial tooth that maintains the normal function of your bite. In order to be a candidate for a successful implant placement you need: the correct amount of bone, good oral hygiene habits, and to refrain from smoking. Request an appointment today at the Oxnard dental office with over 45 years of experience – Carson & Carson, DDS (805) 983-0717. You can find more detailed information about the average cost of dental implants here.